Ekam, a branded convenience store to shop scented candles online in India, went live with a brand new digital platform today. A new e-commerce website was released online with the intent of giving the shoppers a more enhanced and evolved virtual shopping experience through Ekam. That’s not all; to make the overall experience fulfilling the site now also supports requests to get free sample deliveries of tea-lights and melts of selected fragrances. They say new tidings come along with each new festive season. Ekam, the home to buying home fragrance products online, has packed the new website with quite a lot of exciting, never seen before facilities for an online shopping destination of this genre. Along with an expanded range of scented candle variety, they now also feature a host of other products in the segment of fragrances, decor accessories and gifts for the upcoming festive season. Shoppers can now choose from an array of scented candles such as pillars, votive, tea-lights, and designer candles. A separate section has been dedicated to flameless home fragrances filled with a wide choice of best reed/aroma diffusers and room fresheners in India. Be it for spiritual purposes, gifting, home decor, home lighting or simply treating the human senses - buyers have a massive variety to choose from. As mentioned earlier, to deliver a wholesome buying experience to the end-user, Ekam now provides the online buyers with a slew of unmatched facilities. ‘Free Shipping’ for all products during the launch period. If you still don’t like what you bought, just feel free to return it and get a full refund before use/lighting. 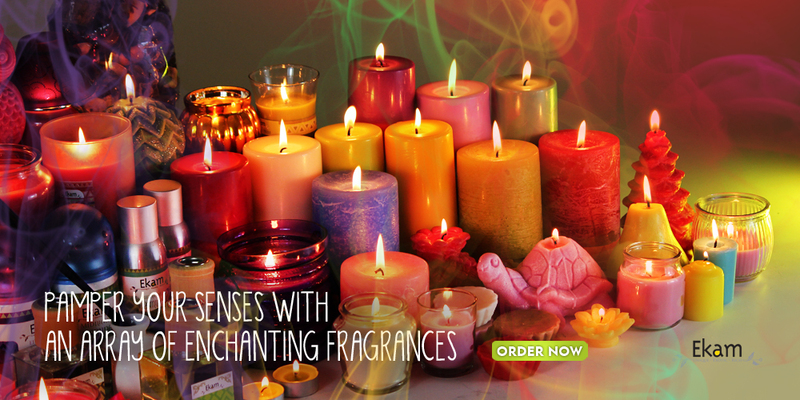 This all new website platform is sure to raise the bar of online shopping experience for anyone who wishes to buy home fragrance or scented candles online in India, a welcoming experience for any occasion. Ekam is a brand owned and manufactured wholly by Primacy Global Enterprises Pvt Ltd (PGEPL). It has five candle manufacturing units – two in India and three in the US. It also manufactures many Aerosol products. PGEPL shares its parentage with some of the bestselling fragrant candles found in USA, Europe, Australia and other markets. Primacy Candles can be found in some of the world’s leading retail stores - Wal-Mart, Dollar General, Bath & Body Works, Tesco, Carrefour, Candle Artisan, etc. We are extremely proud of our 'Made in India' candles and now our aim is to make Ekam the most preferred choice in Home Fragrances segment in India. We are singularly committed to customer. We want that each product made by us to be the ideal source of beauty and satisfaction and we go to great lengths to ensure the same. We create designs with an edge over the others and even our fragrances are unique blends which are distinct from others. We adhere to stringent international standards, ensuring there is no indoor pollution. We closely monitor production for quality compliance and rigorously test-burn our sample candles to meet the desired standards. And, we source environment-friendly ingredients from the world's leading suppliers. Please see our Quality Promise for more details. For India, we conduct scientific market studies on a model customer base to shortlist the most preferred styles, fragrances and pricing. You can pick from a wide variety of fragrances and styles. Home fragrance website, Ekam, a branded convenience store to shop scented candles online in India, went live with a brand new digital platform today. The site now supports requests to get free sample deliveries of tea-lights and melts of selected fragrances. Along with an expanded range of scented candle variety, they also feature a host of other products in the segment of flameless fragrances, home decor accessories and gift items for the upcoming festive season.